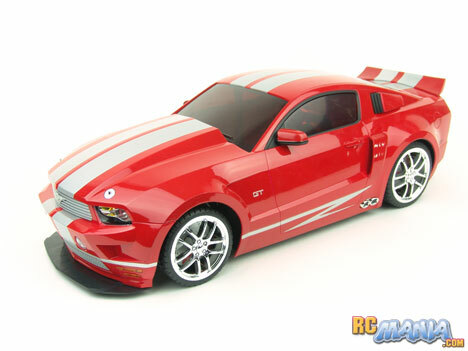 In the MaxTech Maxx'd Out "Custom Design Series" of 1/10th scale RC cars there are, as of this writing, an orange Dodge Challenger and the red Ford Mustang pictured above. Chosing between them was very difficult for me, because they both look great. The Mustang I ended up picking has a widebody kit with ground effects, a tall hood and long decklid spoiler, and the detail and fit & finish around the body is as good as I could ask for. At 19" long, this 1/10th scale car makes a real visual impact wherever it is, even if it's sitting idle on a shelf. It comes with a pistol grip controller plus both batteries needed to run, and a wall charger for the car's rechargable pack. Street cars are always easy to test, because there's a very narrow range of surfaces that they'll drive on, and they mostly either go fast and turn well, or they don't. This one turns okay, but does not go fast at all. It is downright slow. Like a sloth. Like a snail. It is pitiful. See for yourself in the video. There is nothing further I have to say about this test. This MaxTech Maxx'd Out 1/10th scale RC car is so slow, I wanted my money back the moment I squeezed the trigger for the first time. It is so slow, it made me angry to drive it. It is so slow, it is making me angry just writing about it. It is so slow, and I am not joking here at all, I would literally not keep it if someone paid me to take it from them. It is so slow, it should be sold as a display model with no controller, no battery, and no motor. I feel personally offended that a manufacturer would have the gall to sell something so big, bright, so great-looking, but so godawfully slow, as an "RC" car. Even for a child much younger than the minimum recommended age, who may enjoy it even with its staggeringly limited speed, the $55 USD price tag is an absolute ripoff. This was a complete waste of my time and money. It's a perfect example of what I call RC Malarkey.